A record quarterly operating profit estimate of $5.9 billion elicited only a market raspberry. Yet the Korean firm’s shares look cheap, its Apple-rivalling smartphones are booming and the Samsung brand just came out top in Asia. Investors may be missing the wood for the trees. In earnings guidance on July 6, Samsung Electronics, the world’s largest maker of TVs, smartphones and DRAM memory chips by volume, estimated that operating profit jumped 79 percent to 6.7 trillion won ($5.9 billion) in the April to June quarter from a year earlier. Sales of the Galaxy smartphone drove the record performance, though the South Korean tech giant expressed concern that Europe’s debt crisis is denting demand in its biggest market for televisions and home appliances. The average forecast in a Reuters survey of 23 analysts was for 6.67 trillion won of operating profit. That forecast had been revised down slightly due to delays in shipping the latest Galaxy S III smartphone. 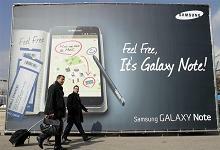 Samsung estimated its second-quarter revenue at 47 trillion won, just below a 50 trillion won forecast. The company was due to release its full second-quarter results towards the end of July - the first report since former components chief Kwon Oh-hyun took over as chief executive. In a ranking of Asian brands by Campaign Asia-Pacific released on July 5, Samsung claimed the top spot overall for Asia-Pacific, beating Apple into second place overall - though the Silicon Valley technology firm headed the rankings in China.